"For your crimes against humanity, I find you guilty! May God have mercy on your soul!" Judges: the self-appointed lawgivers among hunters. Judges understand that evil is a choice, not an affliction. The abomination who stalks and kills people can be a monster... or one of the imbued. What drives these hunters to decide who lives and who dies? Arrogance? Prudence? Insight? The answer could tip the scales. 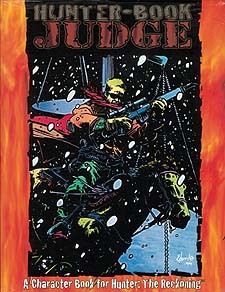 Hunter Book: Judge is part of a Hunter: The Reckoning series dedicated to the creeds, the character types of the imbued. Learn Judges' philosophies, motives and ultimate goals in weighing the crimes of the supernatural. All these new Traits, edges and rules help ensure that the punishment fits the crime. Court is always in session.